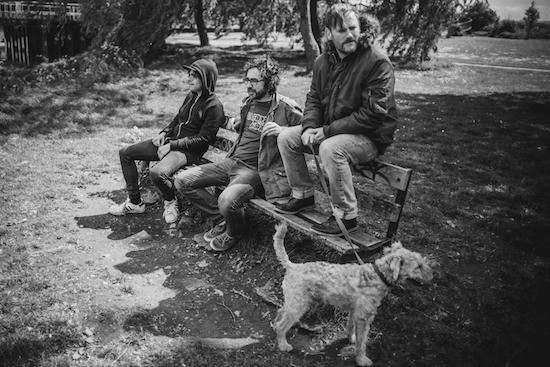 BEAK> have announced a split EP with themselves with invada Records set to release a brand new four track ‘double B-side’ EP featuring two tracks from BEAK> on one side and two from <KAEB on the other. The difference between the two, it is outlined, is that <KAEB features “an ever expanding and floating membership.” One of the two tracks from <KAEB, ’There’s No One’, features vocals from Brainfeeder associate Jonwayne. The split EP follows the release of the three piece’s 2012 album >>, while they will soon provide the score to upcoming film Couple In A Hole, set for release later in the year. The BEAK><KAEB split EP will be available to buy digitally and on vinyl in late July and they are set to support Godspeed You! Black Emperor shortly before that at London’s Roundhouse on June 30. Tickets for that show can be purchased here.